What are the benefits of vertical gardening? One of the biggest advantages of growing vertically is that it saves space in the garden, so you can grow more in the same amount of space. 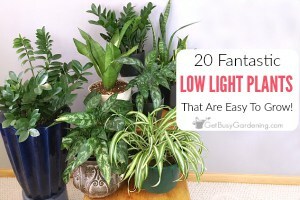 But there are so many other wonderful reasons to grow vertically! 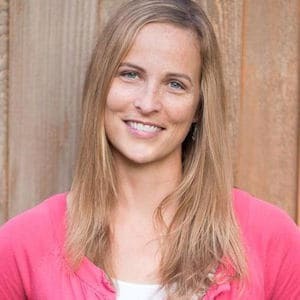 Below I will discuss each of the vertical gardening benefits in detail. Not only does it look cool, but there are lots of advantages of vertical gardening. 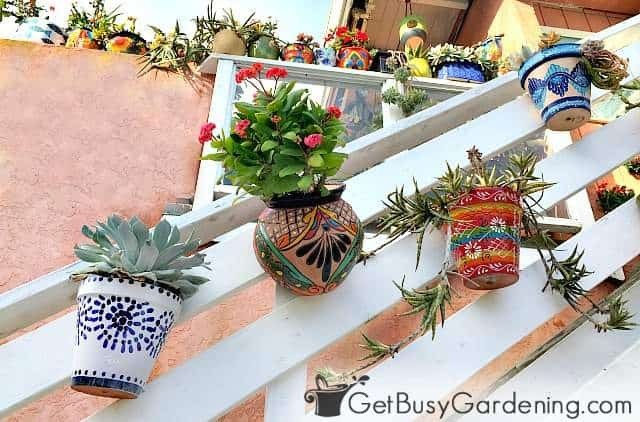 Vertical gardening is a wonderful way to grow your favorite flowers and food, and it’s beneficial to both your garden and the plants. When vining plants are grown on vertical supports, rather than allowed to sprawl on the ground, they take up less space. In addition, growing plants in vertical container gardens allows you to grow more in a smaller areas, like your deck or patio. On of the biggest advantages of vertical gardening is that you can make use of spaces where you otherwise couldn’t grow anything – like on walls and fences. Plus when you grow plants vertically in containers, you can place them wherever you have sun. Utilize spaces like a sunny driveway, hanging from your balcony, or even on a rooftop. Growing plants vertically adds beauty and visual interest to the garden. Vertical structures and supports can be used in gorgeous ways to create privacy, hide unsightly areas, or add garden rooms and secret spaces to your yard. 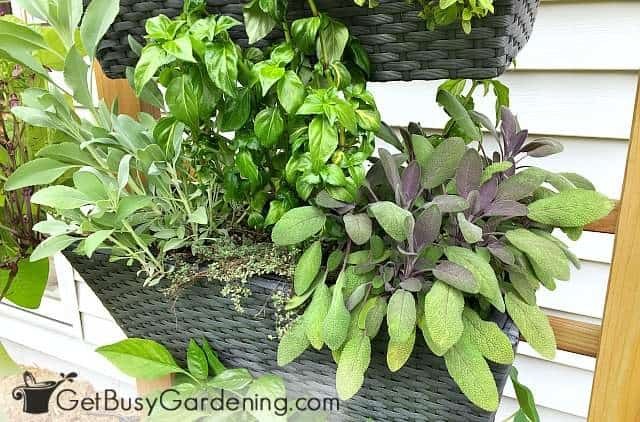 One of my favorite benefits of vertical gardening is that it makes maintaining your garden much easier. Using vertical containers also makes maintenance easier, since problems like weeds, ground-dwelling pests, and soilborne diseases basically become non-existent. 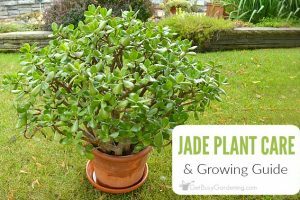 If you have a shady garden, vining plants can grow up and into the sun where they will be able to thrive better than those left growing on the ground. Trellising climbing plants slows down the spread of soilborne fungus and disease, keeping the plants much healthier. Plus, vining vegetables and flowers won’t be prone to rotting like they are when left sitting on the ground. Another one of the benefits of vertical gardening is airflow. Growing vining plants vertically allows for better air circulation around the plants. This means that the leaves will dry out faster, which will help to prevent problems with fungus and disease. 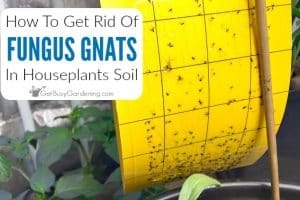 Getting your plants up and off the ground will keep them out of reach of hungry ground-dwelling pests. 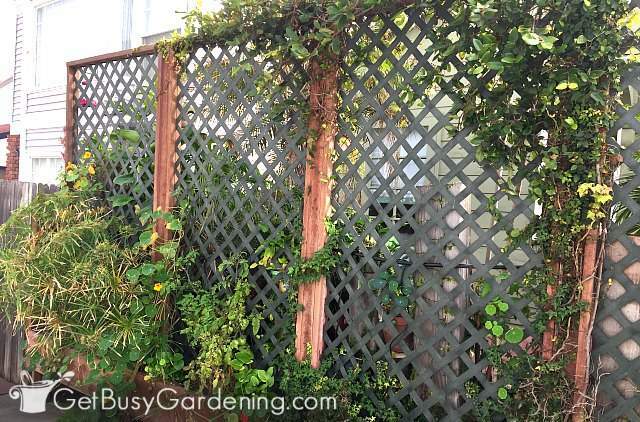 Growing trellising vining plants also makes it easier to protect them. You can simply encircle each plant with chicken wire or garden fencing to protect them from hungry animals. 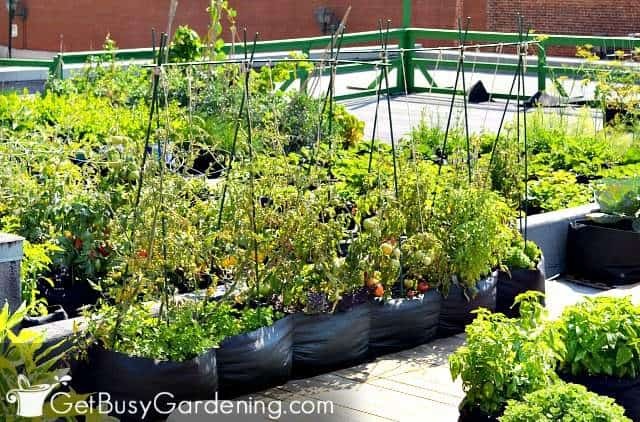 Whether you choose to trellis vining crops, or plant vegetables in a vertical container garden, growing food vertically will give you larger harvests. Vining crops produce larger yields than bush or patio varieties, while vertical containers provide exponentially more growing space than a traditional garden plot. 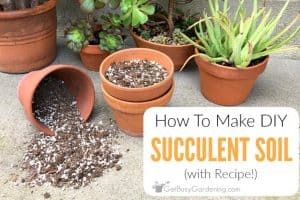 One of the great advantages of vertical gardening that many people don’t think about is that it makes harvesting easier. Vertical structures bring your crops up to eye-level, making them much easier to harvest. 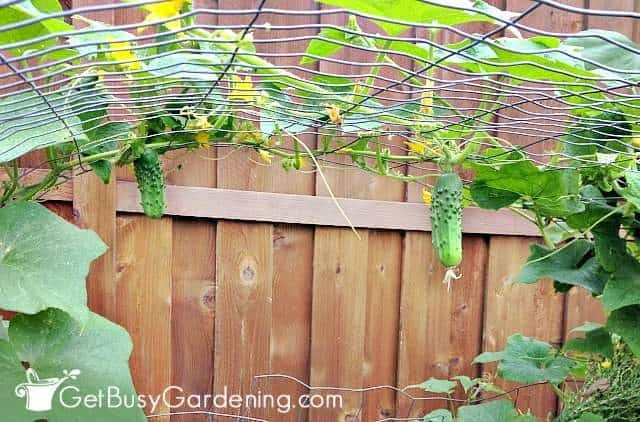 Plus, vegetables will hang down from their growing support, making them easier to spot. Vegetables grown vertically are prettier than crops grown on the ground. The fruits grow straight when trellised, since gravity pulls them down. Plus, there won’t be an ugly yellow spot on heavier vegetables, which happens when they are left lying on the ground. Food grown vertically is also much cleaner than plants on the ground. When you grow food vertically in container gardens, or by trellising the vines, soil won’t splash up on them. 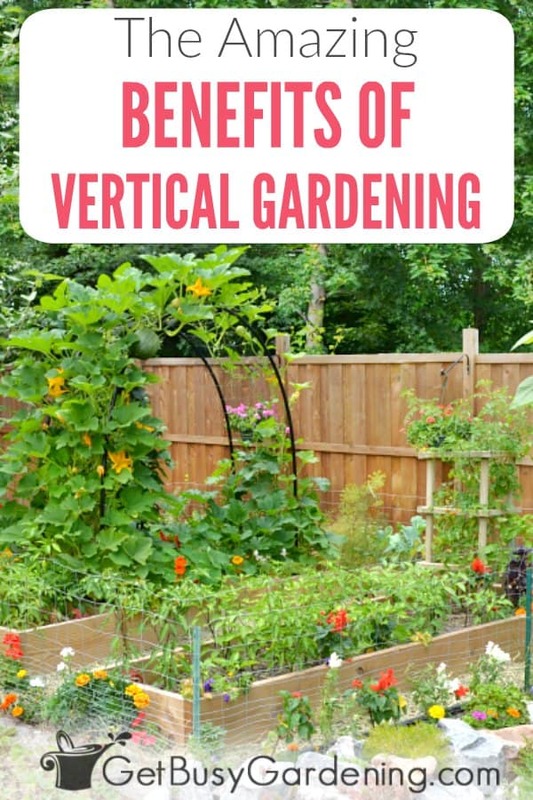 There are so many important benefits of vertical gardening. Your garden will be healthier, your crops will be better, and you will spend less time weeding, feeding, spraying and watering your garden. If you want to learn even more, then my Vertical Vegetables book is just what you need. It will teach you everything you need to know about how to grow your favorite crops vertically. Plus there are almost two dozen step-by-step DIY projects in the book that you can build yourself! 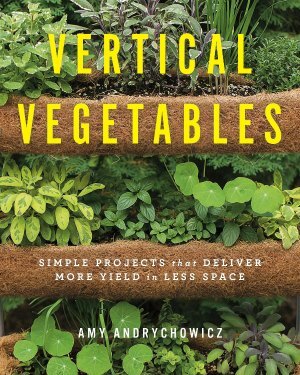 Learn more about my new Vertical Vegetables book here. 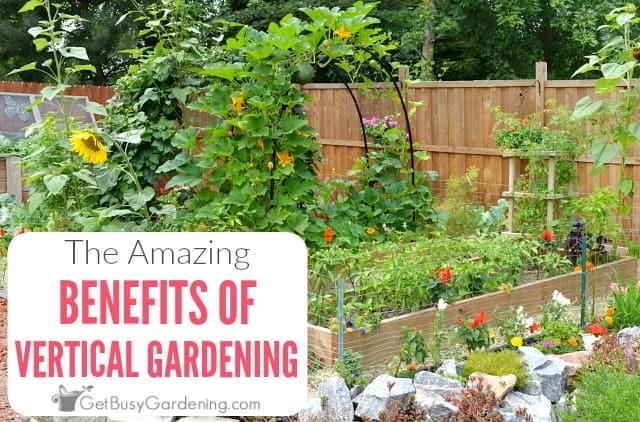 What benefits of vertical gardening would you add to this list? Share yours in the comments below.